"Don't be fooled by cheap imitations"
"They" can go. "Tres Amigos" can stay. You've seen him if you've driven through the country. He's a booted and hatted cowboy, leaning up against a building or fence post with no visible means of support other than his fence post. Who is he? He's whoever you want him to be. Slim Pickens or Rowdy Yates. Jack Palance or Jon Voight. He could be waiting for the last round up, or waiting for Godot. He could be waiting for high noon, or he's a desperado waiting for a train. He's certainly a midnight cowboy, for he's usually a man in black. Somehow we think he's related to the serape-clad, sombreroed Mexicans who've been reclining against cacti on Mexican restaurant signs ever since Independence. If the neighborhood he's found in is more country than western, he may have just told his boss to take his job and shove it and what he's waiting for is not the last round-up, but his last pay check. He might be an urban cowboy who's been locked out of his trailer, or maybe he's got to roll-his-own outside because Miss Kitty doesn't allow smoking in the Long Branch anymore. Sometimes he's seen wearing a cloth bandana, which some people think is the finishing touch. These are the same people who tie bandanas around their dog's necks. We think it's Ralph Lauren. Is he a tragic figure? Are his days numbered? Will he be the first 21st century totem to walk the lonely road to oblivion? That road that's littered with BABY ON BOARD! signs and Beanie Babies? Or will he endure like the pink flamingo and the painted concrete deer? If it weren't for his cowboy hat, he might seem more menacing. His slouch tells us he's not energetic enough to be a burglar, or maybe he's differently-abled from bull riding. We've even seen variations on this theme. There's the Midnight Cowgirl, who isn't quite as popular. Her posture and one-foot-prop make her look like Irma La Douce or the statue of Selena in Corpus Christi. 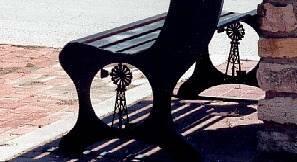 While we're on the subject - we'd like to applaud the (non-West Texas) towns of Hico and Glen Flora for their functional metal sculptures in the form of benches. There's the even-less menacing silhouette of a slouch-hatted, waving man, whose physique tells you he's past middle age. His other arm is clutching the fence-post for support. Whatever reason there is for buying a James Drury/Dean cowboy silhouette, we'd really like to hear the reason for buying one of these. In the Martha Stewart Yard Ornament catalog he's probably called the "Wal-Mart Greeter." 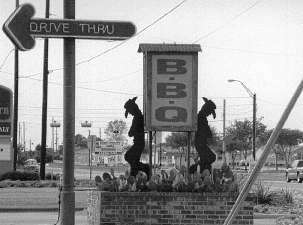 Between Giddings and Elgin, Texas on Hwy 290, there's actually both a "Greeter" and a cowboy on the same fence line. They're about 150 feet away from each other and the old man seems to be trying to get the attention of the cowboy. Maybe he wants him to help move a silhouette piano into the silhouette bunkhouse. Why would people, most of whom prefer not to have people (cowboys or otherwise) loitering around their house, pay good money for an imitation loiterer? Does putting one of these in your front yard tell real cowboy loiterers to "move on, this place is taken"? Or is it used as a decoy to attract other cowboy-loiterers so that they can be shot and put in the crawl space? Fort Stockton Version of Cowboy Silhouette. Since we're always looking for the good in things here at TE, let us say that even though we don't like the cowboy silhouette, we have to applaud the variation we saw in Fort Stockton recently. 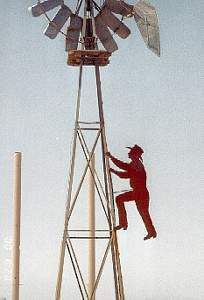 Black Bart is produced so that he can blend in with (or stand out on) the omnipresent icon of West Texas - the windmill. It makes us glad for the thought that went into it and it makes us happy that Bart is finally showing a little energy and making himself useful. Perhaps there's a silhouette of an oilcan in his back pocket. While this variation is priced about the same as the "traditional" silhouette, the windmill accessory adds to the price. The Cowboy Silhouette as Art. "Tres Amigos" by Sul Ross State University Art Director Bob Hext is what people would really like to have in their yard. Tres Amigos was done from life, with three real local cowboys posing for the sculpture, although it is a bit larger-than-life. Mr. Hext has graciously sent us a photo as the sculpture appeared when it was installed. 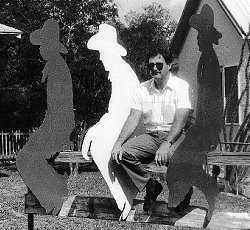 Tres Amigos has also been included in the book A Guide to Outdoor Sculpture in Texas. The sculpture is also known as "The All-American Cowboy" since the figures are painted red, white and blue and will appear in that order of color if they're viewed from left or right. It stands in front of the Alpine Chamber of Commerce, where a tree now appears to be blocking their line of sight (something cowboys hate). We hope that when the Alpine Chamber gets its new director, that one of the first things they do is to raise the branches on that tree, so that visitors to Alpine can appreciate this sculpture as it was intended.